Usurper (noun): a person who takes a position of power or importance illegally or by force. Diego Zambrano in the Lawfare blog has outlined the constitutional validity of the presidency of Juan Guaidó and the illegitimacy of Nicolas Maduro who is an usurper. It is Maduro who has carried out a slow motion coup undermining Venezuelan democracy. "The present Venezuelan crisis began on Jan. 10, when Maduro was sworn in for a second term scheduled to end in 2025. Nobody seems to dispute that his first term ended that day, in accordance with Articles 230 and 231 of the Venezuelan Constitution. The relevant question is whether Maduro was in fact reelected and legally president after Jan. 10. 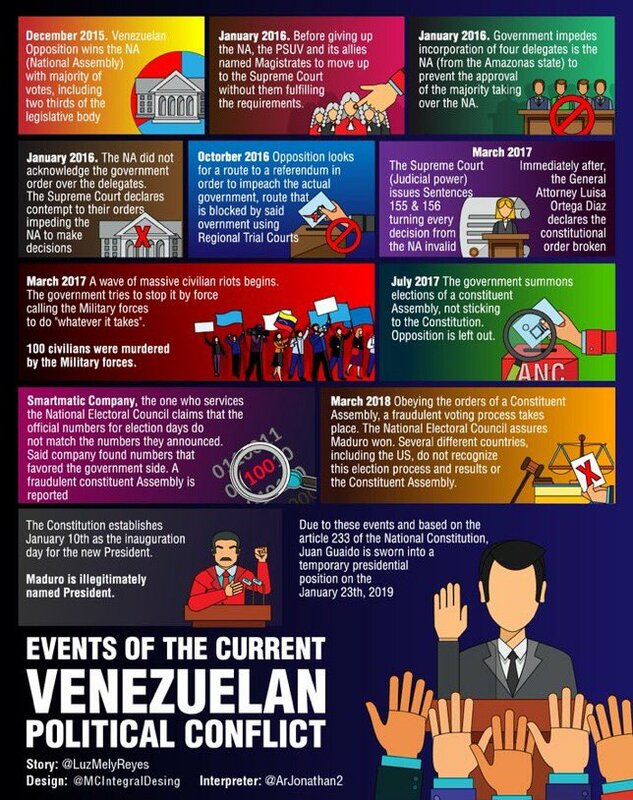 Any plausible reading of the constitution shows that Maduro was not reelected and, indeed, that there has been no election at all for the term beginning Jan. 10. Article 293 governs the process for calling and organizing new presidential elections, delegating to the National Electoral Council control over the process. Members of that body are nominated through a complicated scheme that gives significant power to the National Assembly, the country’s unicameral legislature, under Article 296. To Maduro’s chagrin, however, the National Assembly has been under opposition control since 2015. In an attempt to circumvent the National Assembly, Maduro created a parallel legislature under Articles 347 and 348. These provisions, however, were meant solely to call for a constitutional convention and required a national referendum (like the one in 1999). Knowing that a popular vote would defeat his proposal, Maduro concocted an “electoral” process that would ensure every member of that alternate assembly would be under his control. That entire process was outside of the constitutional structure and violated the procedures prescribed by Article 347 and Venezuelan law. Under any sensible reading of the constitution, there was no basis for a parallel legislature nor the process by which it was staffed. Here’s the key connection between that parallel body and the Venezuelan presidential elections: In 2018, the unconstitutional assembly called for, and organized, a presidential election—in direct violation of the constitution. The alternate assembly sidelined the actual National Assembly’s role, staffed the National Electoral Council with Maduro loyalists, and ensured another “election” that would keep Maduro in power." 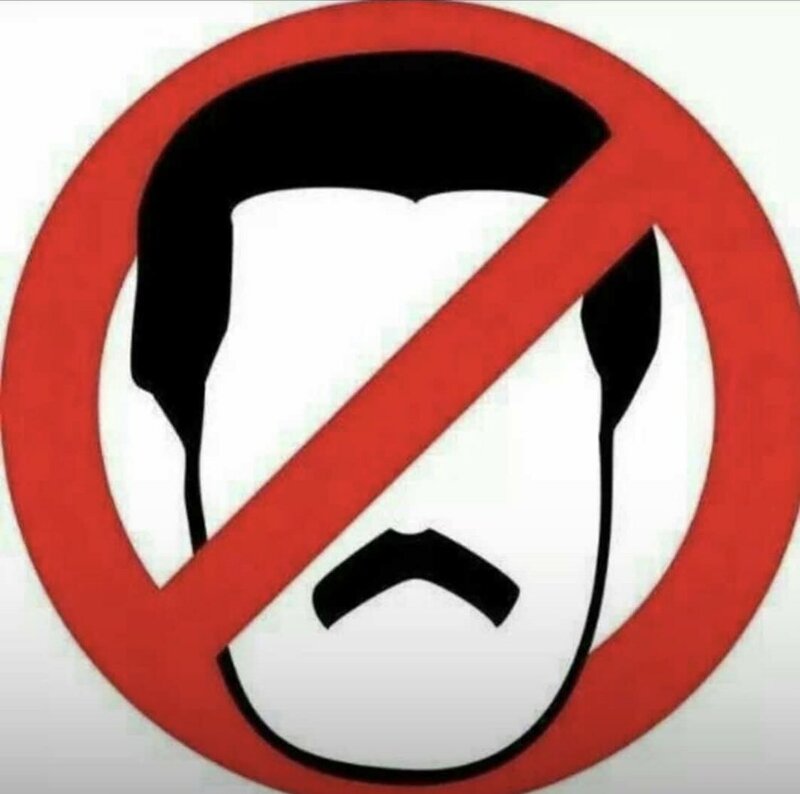 On December 1, 2015 on his weekly television show Nicolas Maduro spoke clearly on how he would respond to an opposition victory in the legislative elections: "I will never allow this to happen, ever. I would go out on the streets and fight side by side with the people." 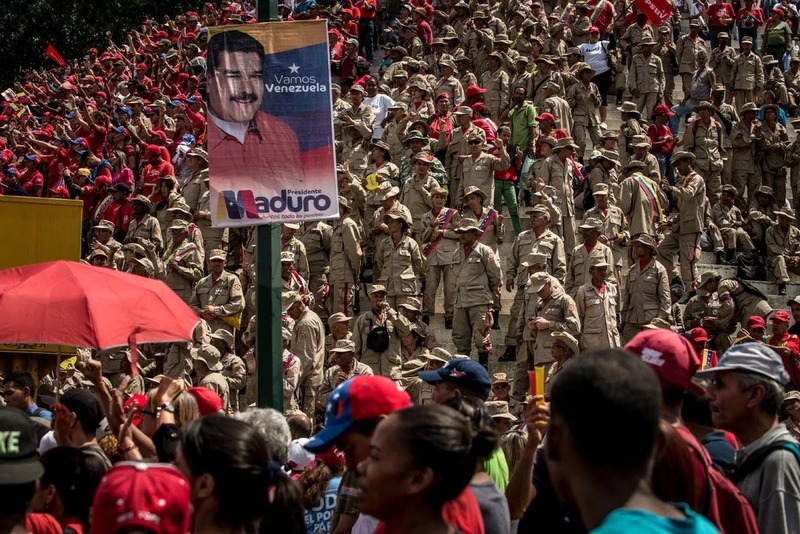 Even if he were to lose in the elections Maduro declared: "Were we to lose, which I find unimaginable, I will govern with the people in a civilian-military alliance." Maduro lost the vote, but the opposition had to defend the results. Venezuela is not a democracy, but a country where contested elections are held within an anti-democratic regime. This has meant that the opposition had to take to the street to ensure that the vote be respected on and following the December 6, 2015 election. There are prisoners of conscience today in Venezuela and the democratic opposition is demanding their release in an amnesty before Christmas which Maduro rejected. Furthermore the Maduro regime packed the Supreme Court and used the court to undo the results of the National Assembly elections by challenging the results in 22 races. By denying the opposition its super majority it opens the path to gutting the National Assembly's powers replacing it with a newly created and un-elected communal congress. Maduro took things a step further using the supreme court to strip the National Assembly of the power over the Central Bank and leaving it firmly in the executive, i.e. Maduro's hands. 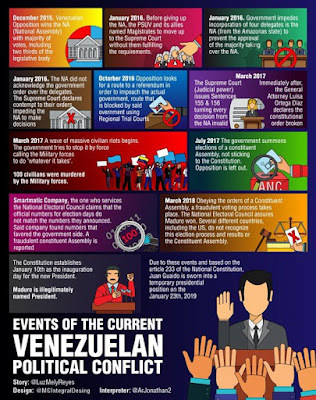 On October 20, 2016 Nicolas Maduro illegally suspended a recall referendum because the dictatorship knew that it could not obtain a favorable result. 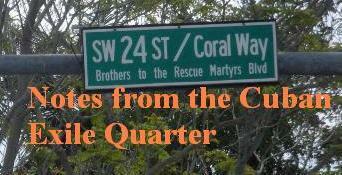 The so-called vote for a Constituent Assembly on July 30, 2017 was to do away with the last vestiges of the old democratic order following the Cuban Stalinist model as the end goal. This is why it was so profoundly unpopular. Despite threats of reprisals from the Maduro regime for those who did not go out to vote only 12.4% of Venezuelan voters took part in the sham election and 87.6% abstained from taking part in it. The Office of the Special Rapporteur for Freedom of Expression of the Inter-American Commission on Human Rights (IACHR) condemned "the new measures taken by the Government of Venezuela to prevent the exercise of the right to freedom of expression, freedom of the press, and to prohibit the exercise of the right to protest and peaceful assembly in the context of the electoral process convened on July 30, 2017 for the National Constituent Assembly." Ration cards were issued for food in a country were mass hunger is an ever present reality and it is understood by many that following regime instructions, such as going to vote in a sham election, is necessary to be eligible for rations. The Maduro regime has continued, the process started under Hugo Chavez, of taking over sectors of the economy. The electoral calculus is clear: "Everyone who has this card must vote," said Nicolas Maduro and continued, "I give and you give." This is part of the reason why the international community refused to recognize the May 20, 2018 election. It was called early by Maduro, and did not respect international norms. Foreign power interfering in Venezuela's internal affairs for decades. 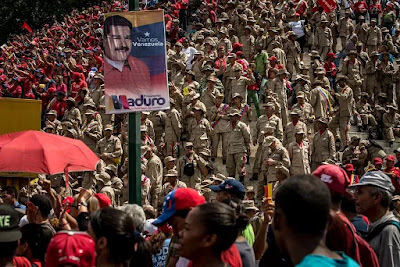 Thousands of Cuban military advisers and intelligence officials assisted the Chavez and Maduro regime's consolidate power to first form and then entrench the dictatorship in Venezuela. 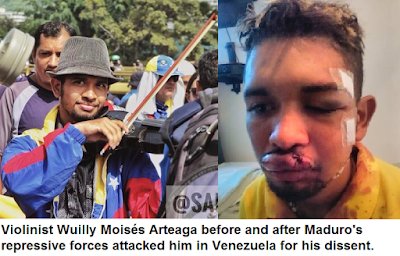 OAS Secretary General Luis Almagro correctly describes it as "being like an occupation army." 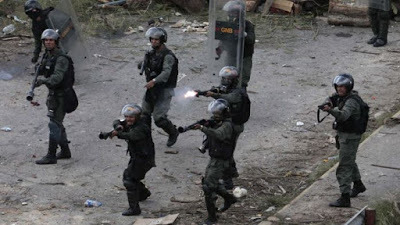 Ramiro Valdez, the Cuban official who constructed the police state in Cuba with the help of the East German Stasi and Soviet KGB, has spent a lot of time in Venezuela installing the police state there. Nicolas Maduro with his Cuban handlers has undermined the National Assembly, stacking the supreme court, creating an anti-democratic parallel assembly while centralizing all power in the executive, and outlawing freedom of assembly, speech and association. 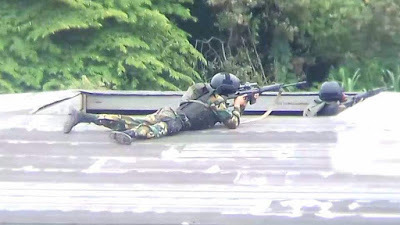 Maduro's regime has invited Russian mercenaries to protect him in Venezuela. Reports indicate that their are 2,000 Russian nationals working in intelligence roles and reporting to the Ministry of Defense. What we are witnessing today are the last elements of Venezuelan democracy found in the National Assembly seeking to mobilize itself and the country around the constitution and the rule of law to defend itself from Nicolas Maduro, the Venezuelan tyrant backed by Cuba, Russia, Mainland China, North Korea, Turkey, and Nicaragua.